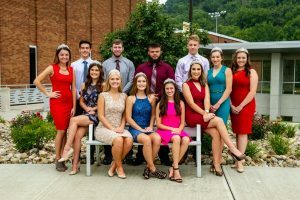 The 2018 John Marshall High School Homecoming King and Queen will be crowned Friday, September 21, 2018 during halftime when the Monarchs host Parkersburg South at Monarch Stadium. Kickoff is 7:00pm. The annual Homecoming Dance, sponsored by the John Marshall High School Student Council, will be held in the school’s gymnasium on Saturday, September 22, 2018. Sitting from left: Caitlyn Robinson, Madison Linzy, Sydney Zimla, Lydia Knutsen and Jewell Kesselring. Standing from left: Payton Thompson, Anthony Siler, Chas McCool, Brady Williams, Austin Keller, Claudia Callahan and Montana Mason.